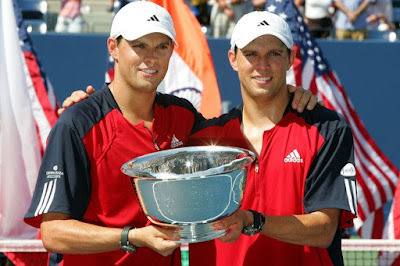 American twin brothers Bob and Mike Bryan won their seventh Grand Slam men's doubles crown defeating India's Leander Paes and Czech Lukas Dlouhy 7-6 (7/5), 7-6 (12/10) to take the U.S. Open title. The Bryans, who ran through the tournament without losing a set, previously won Slam crowns at Roland Garros in 2003, the US Open in 2005, Wimbledon in 2006 and the Australian Open in 2006 and 2007. The defeat denied Paes a chance at a U.S. Open doubles double, having already claimed the mixed crown with Zimbabwe's Cara Black. The victory enables the Bryans to move back into the world number one ranking from second.